ruggedness and long-term stability for continuous use in the harshest environments. reducing maintenance costs and spare parts inventory. Safety, quality, productivity: that’s what’s most important to you. And that’s why our approach to designing analyzers and sensors is based around a simple challenge – how can the design, handling, and maintenance of our products help you reach your goals? 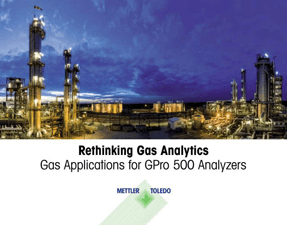 This led to us rethinking gas analytics and the development of a unique portfolio of gas instruments that offers you faster measurements, greater process availability, and unequalled ease of use. 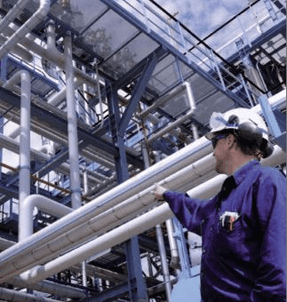 The GPro 500 TDL O2, CO, CO2 and moisture analyzers are designed for ease of installation and low maintenance operation in a wide variety of process applications in the refining, petrochemical, and associated process industries. This eBooklet is intended as a convenient reference to a selection of the most common GPro 500 applications. Gas control in industrial processes is vital in preventing the build-up of unwanted or explosive gas mixtures. Therefore is crucial to monitor the O2 and CO concentration before it reaches critical levels and creates an explosion risk. The continuous, real-time measurements from in-situ sensors is the most efficient way of monitoring oxygen and CO levels. Combustion processes requires reliable oxygen measurements to ensure operating safety and to maximize efficiency. In addition, tight oxygen control leads to significantly reduced fuel costs and reduction in atmospheric emissions of undesirable combustible and greenhouse gases. Achieving these goals requires a totally reliable, accurate and low maintenance analyzer that is able to operate continuously with minimal user intervention. Inerting is all about avoiding potentially hazardous situations at any given time by keeping the oxygen level below the LOC (Limiting Oxygen Content), after deduction of a safety factor. Typically, inert conditions are obtained by controlling flow and/or applying low overpressure to a tank. However, this method provides no information on oxygen concentration, knowledge of which is particularly important during tank filling and emptying. Therefore, oxygen measurement is added to the inerting system. In-line oxygen measurement and control eliminates the need for complicated sampling and conditioning systems. In the Pharma, Chemical, and Food and Beverage industries bulk products are often stored prior to shipment. Oxygen gas is measured to ensure levels do not exceed safe limits. O2 measurement also allows for proper dosage of inertization gas to reduce fixed costs. Inertization prevents oxidation of products to enhance quality and yield. Off-gases are monitored in piping that leads to gas processing units. Measurement of oxygen allows for optimized combustion of synthesis gases in order to comply with environmental regulations. 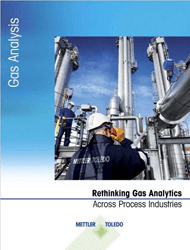 In off-gas monitoring, process conditions can change rapidly. For this application, high oxygen selectivity and fast response time of the sensor is key. This white paper focuses on the importance of oxygen measurement and control to optimize processes in many industries. This eBooklet is intended as a convenient reference to a selection of the most common GPro 500 applications.